There are many reasons why adult teeth may need a cosmetic dentist. The most common reason is decay, followed by fractured teeth, and old restorations needing replacement. If we recommend that a tooth with a cavity be treated and more than a few weeks pass after the initial diagnosis, the cavity will almost always get bigger and can cause pain. Once this happens, it will likely require more extensive and expensive treatment. The tooth may even have to be removed and replaced with a false (or artificial) tooth. If you have a cavity and it needs a restoration, there are different kinds of materials that may be used to restore the functionality of the tooth. Please remember that a tooth may need treatment before it causes pain. If a tooth causes pain, it may be able to be saved, but the treatment time and cost typically increase due to the complexity of the necessary procedures. 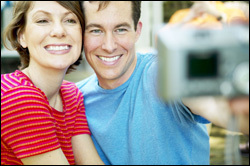 For more information on Cosmetic Dentistry in the Aubrun, AL area call Jim Phillips Jr., D.M.D. Family Dentistry at (334) 821-5291 today!